Maggot infestations in bird food are becoming a frequent problem. The maggots are the larvae of food moths (Indian Meal Moth, Mediterranean Flour Moth and Tobacco Moth). The larvae feed on a wide range of food stuffs including cereals, nuts, dried fruits, chocolate and animal feeds. Larvae in infested foods will produce adult moths which will fly and mate to lay more eggs near other sources of food. The eggs will hatch into young larvae which can burrow through paper, plastic or foil packaging into food stuff. Any food contaminated is rendered unfit for human consumption. The moths are most active during warm periods, mainly between May and September. In areas where conditions are particularly warm and humid (e.g. kitchens and tropical fish areas) they can be active all year round. Once an area has been infested the problem is likely to recur every summer. The most important aspect is to identify any outbreak as early as possible. 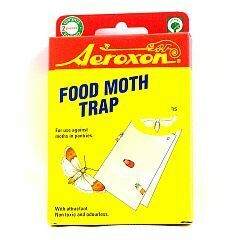 This is most effectively achieved by using Aeroxon 'Food Moth Traps'.